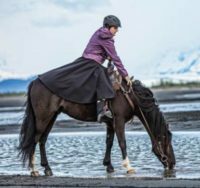 You’re going to look forward to bad weather because now you can laugh in its face once you get your Tongass Rain Riding Skirt. Wear over your riding breeches or jeans, the Tongass Rain Riding Skirt is 100% waterproof + breathable and is the definition of essential riding gear. It keeps you, your saddle, and your horse’s back muscles warm and dry. Put it in your pack or tie in on your saddle to be prepared for whatever weather the trail has in store!